Their trip to North Korea just went south. 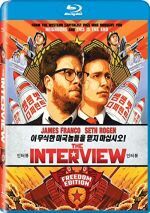 Never in a million years did I think that a wacky Seth Rogen comedy would become a rallying cry for freedom, but that’s exactly what happened with 2014’s The Interview. Internet hackers threatened violent repercussions if the movie got its planned Christmas theatrical release, so Sony pulled the plug. Which you probably already know, so I’ll skip much discussion of the controversy attached to the film and try to view it on its own merits. Tabloid TV host Dave Skylark (James Franco) enjoys his fame and success, but longtime producer Aaron Rapaport (Rogen) longs to do something more substantial. Aaron gets his wish when he finds out that North Korean dictator Kim Jong-un (Randall Park) loves Skylark’s show and will allow Dave to interview him. Dave and Aaron plan to head to North Korea to do so, but with a twist when CIA Agent Lacey (Lizzy Caplan) recruits them to assassinate Kim. We follow their antics as they attempt to pull off this goal. Granted, I get why North Korea felt offended by the movie. It offers the assassination of its leader as comedy fodder, so it doesn’t come as a surprise that controversy ensued. The Interview comes with an edgy concept, so even without the geopolitical ramifications, it seemed likely to stir debate. That would’ve come solely from the outrageousness of the theme, though, for as a political message, The Interview lacks much bite. Oh, it tosses a bone to the notion of freedom and the like, but make no mistake: it exists as a piece of wackiness. Any social/political satire or commentary comes as a token bonus. And there’s nothing wrong with that - The Interview doesn’t need to try to make strong political points. If all it wants to do is offer a nutty comedic adventure, that’s perfectly fine. In that regard, The Interview offers decent entertainment. Like other Rogen movies, it comes with more than a few ups and downs along the way, however. In particular, the story takes quite a while to get cooking, as it feels like the opening act drags. We know where the narrative wants to go but the filmmakers dilly-dally too much on the way there. Even after the plot starts to get into gear, The Interview never quite zings. At 112 minutes, it seems long for what it wants to do, especially since it comes with such a thin premise. In truth, the story probably would’ve worked better as a 15-minute short and not a full feature film; there’s just not enough substance to sustain a nearly two-hour movie. Even with those pacing/length issues, The Interview manages to keep us reasonably amused. The premise brings us plenty of good opportunities for humor and the movie manages to milk them to positive effect. While we don’t find constant laughs, we locate enough chuckles to sustain us. The actors do well in their roles. Rogen breaks no new ground, but he does fine. Actually, I guess Aaron allows Rogen to grow up a little bit, as he presents a more mature character than the actor normally plays. This falls into “baby steps” territory, but the role does display some maturation for Rogen. Franco brings us a probable “love it or hate it” performance as Skylark, and I mostly like his work. I don’t view Franco as a natural comedian, so his take on the superficial talk show host can seem forced, but he still creates more than a few funny moments. I especially like the earnestness he brings to the part, as Franco adds a bit of dimensionality to an otherwise thin role. Speaking of which, Park delivers a surprisingly rich turn as Kim. Like the others, he mostly plays the part for laughs, but he brings a gentle innocence to Kim that comes as a surprise, and a pleasant one at that. Ultimately, The Interview seems like a film that’ll entertain fans of its creators and that’s about it. An up and down affair, the movie boasts decent laughs but it lacks the consistency to make it an above-average effort. The Interview appears in an aspect ratio of approximately 2.40:1 on this Blu-ray Disc. From start to finish, the movie looked great. Sharpness appeared strong. If any softness occurred, I didn’t see it, as the image displayed crisp and concise information. Jagged edges and moiré effects created no concerns, and edge haloes were absent. Print flaws remained absent, as we found no specks, marks or other issues. Like most modern movies, Interview opted for a teal and orange palette. Within those parameters, the hues looked well-developed. Blacks seemed dark and tight, while shadows appeared smooth and concise. This became a terrific presentation..
As for the DTS-HD MA 5.1 soundtrack of Interview, it offered an experience typical of comedies, as the soundfield displayed an emphasis on the forward channels. Music showed nice stereo imaging and moved the songs and score to the back speakers. Most of the effects tended toward environmental material, though a few sequences added some pep; for instance, a few action elements showed solid information around the room. Nonetheless, the majority of the mix stayed dialogue-intensive and without real theatrics, at least until the movie’s climax. Audio quality came across as good. Speech seemed natural and distinct, and I noticed no issues related to edginess or intelligibility. Music was reasonably full, with clear tones overall. Effects were accurate and concise, without distortion or other concerns. Nothing here excelled, but the audio was fine for a comedy like this. When the disc launches, it comes with 19-second introduction from actor/director Seth Rogen and director Evan Goldberg. They applaud our stand for freedom in this amusing little clip. And by “stand for freedom”, they mean our decision to purchase a copy of their controversial movie. From there we get an audio commentary with Rogen and Goldberg. Both sit together for a running, screen-specific look at story/character areas and editing, cast and performances, sets and locations, effects and music, visual design, cinematography and costumes, influences and related areas. My only complaint here comes from dead air, as the track suffers from more than a few empty patches. I get the feeling these result from the removal of potentially problematic remarks, not from a lack of content. Rogen and Goldberg are such chatterboxes that it’s hard to believe they ever shut up, much less leave so many spaces, so I suspect the lawyers chose to delete some of their observations. Whatever the case, Goldberg and Rogen bring us a strong commentary despite the gaps. They make this a funny conversation and they cover the movie’s creation in a lively, honest manner. There’s a lot to like about this good discussion. Note that Rogen and Goldberg recorded their commentary a couple of months before the movie’s planned-for Christmas 2014 release, so we hear nothing about the controversies that affected The Interview. Actually, outside of the brief intro I already mentioned, no aspect of this disc’s supplements address any non-cinematic topics. That’s a shame, as I would’ve liked to hear the participants discuss what happened to The Interview. While I’m not a fan of “double-dipping”, I’d like to see another release of the movie to offer a lively look at these subjects. 14 Deleted, Extended and Alternate Scenes fill a total of 25 minutes, 21 seconds. These mostly expand or change existing scenes, so don’t expect new story content here. Actually, a few minor tidbits of fresh information appear, but these moments don’t add anything noteworthy. They do tend to be funny, though. At 112 minutes, Interview already runs too long, so I can’t say I think any of these moments needed to be in the final cut. They add amusement, however, and are fun to watch on their own. Next comes a Gag Reel. It fills seven minutes, three seconds and presents the standard array of goofs and giggles. A few alternate lines appear, but mostly we get standard bloopers. Under Line-O-Ramas, we find three reels with a total running time of nine minutes, 32 seconds. In these, we see an array of alternate lines. “Line-O-Rama” efforts on other releases have been pretty fun, but this collection seems less enticing. A few laughs result, but not many. A bunch of featurettes follow. We encounter “Directors of This Movie” (6:41), “Spies Among Us” (7:24), “Getting Into Character” (4:47), “Puppy Power” (1:56), “Here Kitty Kitty” (5:19), and “Joking Around” (1:54). Across these, we hear from Rogen, Goldberg, art director Jon Billington, executive producers Kyle Hunter and Ariel Shaffir, cinematographer Brandon Trost, producer James Weaver, tiger wrangler Michael Hackenberger, screenwriter Dan Sterling, and actors James Franco, Lizzy Caplan, Diana Bang, and Randall Park. These shows cover Rogen and Goldberg’s work as directors, influences/inspirations, visual and production design, story/character areas, cast and performances, and animals on the set. Most of the clips remain fairly light and superficial, but taken as a whole, they give us a decent overview of aspects of the production. A Randall Park Audition Tape goes for five minutes, 14 seconds. He participates with an off-screen Rogen – who reads Skylark’s lines – to go through a few scenes. It’s a nice little addition. More from Park occurs during Dating a Dictator. In this one-minute, 10-second spoof, we see Kim Jong-un’s video online dating profile. Though not great, it offers a few laughs. In an unusual piece, we get an appearance on Discovery Channel’s Naked & Afraid from Rogen and Franco. We follow their “attempts to survive” in the wilderness in this 13-minute, 47-second show. It’s not particularly pleasant to watch them naked for almost 14 minutes – even with their naught bits blurred – but it’s pretty funny. Previews finish the disc. We get ads for Fury, The Wedding Ringer, Chappie and Home Sweet Hell. No trailer for Interview shows up here. Remove all the controversy related to The Interview and what do you get? 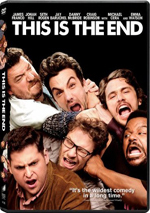 A moderately amusing comedy that resembles a bunch of other Seth Rogen efforts. The Blu-ray brings us excellent picture along with positive audio and supplements. Rogen lovers will enjoy Interview but infamy aside, it probably won’t convert any new fans.